Open all 5mm and 8mm jumprings. Attach a 5mm jumpring to one of the side loops on the TierraCast vine heart link and to one of the TierraCast open heart charms. Close jumpring. Repeat for loop on other side of TierraCast vine heart link. Attach a 5mm open jumpring to the bottom center loop of the TierraCast vine heart link and close jumpring. 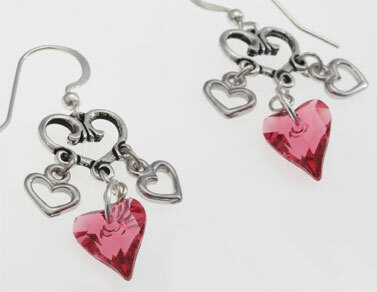 Attach an open 8mm jumpring to the closed 5mm jumpring and attach to the wild heart pendant from the Swarovski crystal assortment. Close jumpring to secure. Open loop at bottom of earwire with pliers and attach to top loop of TierraCast vine heart link. Close loop to secure. Repeat Steps 2 - 5 for other earring.